St Ledger enjoying Irish life despite Leicester "nightmare"
Sean St Ledger has spoken of his "nightmare" time since joining Leicester City ahead of tonight's European Championship qualification fixture between Armenia and the Republic of Ireland. The Irish international, buoyed by the faith shown in him by Republic coach Giovanni Trapattoni, admitted to Irish newspaper the Herald how he yearns to appear for his club but must be content with sitting on the sidelines for the time being. "I haven't even made the bench for the last few games with the club and that's frustrating. It's not down to injury, it's purely tactical," said the defender, "It's hard to get angry with [Sven Goran Eriksson] as he's such a nice man and a good person, he's brilliant to work under. I want to be successful at Leicester. It's a massive club with great potential so I have to keep working as hard as I can to stay in there." St Ledger earned his 21st cap as the Republic beat Armenia 2-1 this evening but is becoming increasingly frustrated at club level. 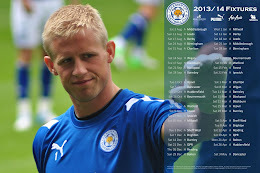 He believes that to succeed internationally, he must be making regular appearances for the Foxes. "Maybe I need to go on loan to get some football for the time being. If we do get to the play-offs I need to be playing if I am to stay in the team and if I'm going to be match fit," continued St Ledger, "I feel fine and sharp but it's difficult and personally frustrating for me to be not playing for my club... It's a bit of a nightmare at the moment, to be honest. I want to play but to keep my place with the Ireland team I need to be playing at club level regularly and I haven't been doing that." With consecutive clean sheets racking-up, Eriksson is unlikely to disrupt a back line that have hit form in recent weeks, with Matt Mills and Sol Bamba forging a formidable centre back partnership that have seen the Foxes now go four league games without conceding. "It's not easy when you can't even make the bench," St Ledger went on, "You only have five subs on the bench in the Championship and our right back can play centre half so they have other options. I just have to deal with it, but it's been a very frustrating period... I have spoken to the manager about it and he said he'll speak to me again after the international break. We have only three centre halves at the club and if one of them gets injured then I am back in the team, but it's not easy."